Tacoma – A portable spa ideal for small spaces. The waterfront city of Tacoma, Washington is tucked between the shores of Commencement Bay and Mt. Rainier. 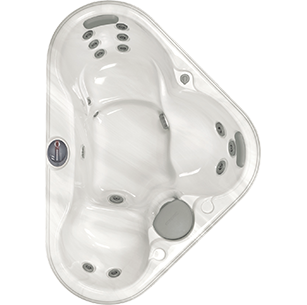 The Sundance® Spas Tacoma™ portable spa, with its curved-triangle shape, fits comfortably into a corner, too. Ideal for small spaces, this hot tub offers hydrotherapeutic benefits found in larger hot tubs – back-therapy seating, armrests, foot jets, and pillow headrests. All these features prove that a small, portable spa can be large on features. With the Tacoma hot tub, you get the shape you want, plus Sundance quality. Thirty years of Sundance experience have gone into the design and production of the 680 Series spas, and each one is backed by a comprehensive warranty – your assurance of the best quality and reliability.